In this tutorial, we will see how to create and use a database in MongoDB. The MongoDB service is starting.. 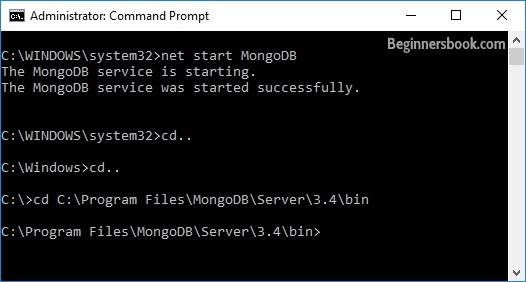 The MongoDB service was started successfully. Note: If the database name you mentioned is already present then this command will connect you to the database. However if the database doesn’t exist then this will create the database with the given name and connect you to it. At any point if you want to check the currently connected database just type the command db. This command will show the database name to which you are currently connected. This is really helpful command when you are working with several databases so that before creating a collection or inserting a document in database, you may want to ensure that you are in the right database. To list down all the databases, use the command show dbs. This command lists down all the databases and their size on the disk. Now we are creating a collection user and inserting a document in it. We will learn how to create collection and document in the next tutorials. You can now see that the database “beginnersbook” is created.